First cut a 6" x 9 1/2" piece of Stampin' Up! 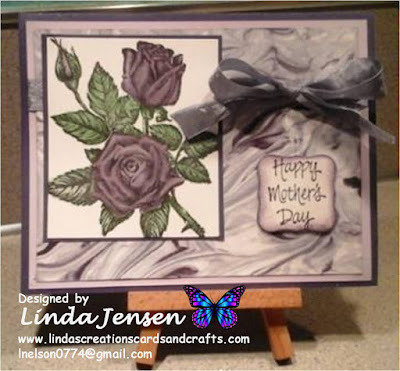 Bermuda Bay card stock and fold it in half for the base, a 4 1/2" x 5 3/4" piece of Stampin' Up! Watermelon Wonder for the first layer, a 4 1/4" x 5 1/2" piece of Stampin' Up! Pool Party for the second layer, a piece of 4" x 5 1/4" of Stampin' Up! Cherry on Top Designer Series Paper for the front layer, and a 1 3/4" x 4" piece of Bermuda Bay for the top strip. Next dry emboss the top strip with a Stampin' Up! Large Polka Dot embossing folder and attach it to the dop of the Designer Paper. Then stamp the cupcakes in the following Stampin' Up! inks: Bermuda Bay, Crushed Curry, Pool Party, and Watermelon Wonder on another piece of white card stock, punch them out with a Stampin' Up! 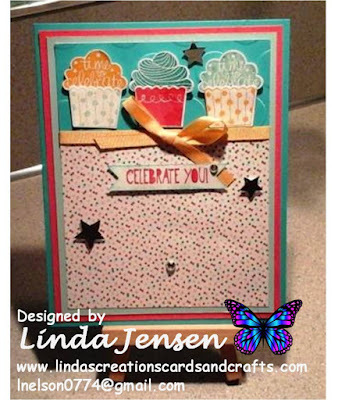 Cupcake Builder Punch, glue the tops and bottoms together then attach them to the Bermuda Bay strip with mini pop dots. Next cut out the sentiment with a Stampin' Up! Bitty Banners die, sponge the edges with Bermuda Bay ink, stamp the sentiment with Watermelon Wonder ink and attach it to the front layer with mini pop dots. Then attach the foil stars with mini pop dots, the self-adhesive rhinestones, tie Stampin' Up! Crushed Curry Ribbon around the front layer, attach the front layer to the Pool Party layer, the Pool Party layer to the Watermelon Wonder layer, the Watermelon Wonder layer to the base and enjoy!